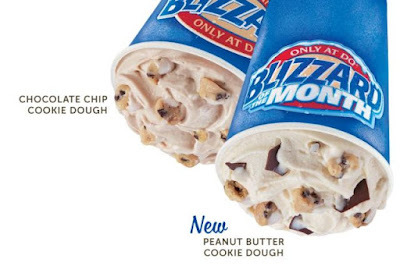 Dairy Queen whips up the new Peanut Butter Cookie Dough Blizzard as the April 2018 Blizzard of the Month. The new flavor features peanut butter topping, chocolate chip cookie dough, and choco chunks blended into vanilla soft serve. Since they share common ingredients, the Chocolate Chip Cookie Dough Blizzard is also back. It consists of chocolate chip cookie dough blended with fudge and vanilla soft serve. - S'mores Blizzard - Marshmallow-filled chocolate and graham cracker pieces blended into vanilla soft serve. - Cotton Candy Blizzard - Cotton candy and sprinkles blended into vanilla soft serve. - Summer Berry Cheesecake Blizzard - Cheesecake pieces, raspberries, blueberries, and strawberries blended with vanilla soft serve. - Jurassic Chomp Blizzard - Large choco-dipped peanut butter bites and fudge blended with vanilla soft serve.